Democratic Rep. Brenda Lawrence (Mich.) was caught playing Candy Crush on her iPhone during President Donald Trump's first formal State of the Union address on Tuesday night. Lawerence, secretary of the Congressional Black Caucus, is playing the puzzle game in a photo posted on the stock photo website Getty Images. 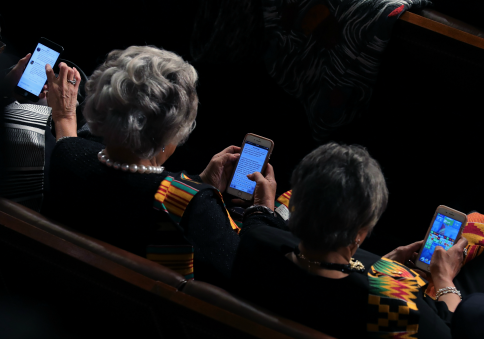 She is shown, phone in hand, sitting next to two other members of the Congressional Black Caucus, Reps. Bonnie Watson Coleman (D., N.J.) and Joyce Beatty (D., Ohio), who are equally glued to their phone screens as the president speaks. According to Getty, the photo was taken roughly one-third of the way through the 80-minute address, at 9:42 p.m., while Trump was discussing his administration's efforts to re-negotiate trade deals to benefit the American workforce. In the photo, while Lawerence is working her way through another level of Candy Crush, Watson Coleman can be seen staring intently at a response to a tweet she sent only moments before, in which she accused the president of surrounding himself with "white nationalists." Beatty appears to be proof-reading her official response to Trump's unfinished speech. "That State of the Union is put out an hour in advance so Democrats and Republicans can read along," a spokesman for Beatty told the Daily Mail. "And while the speech was going on, she was putting together a statement in response." Lawerence, who spent decades as an employee at the U.S. Postal Service prior to her election to Congress, told the Detroit News last month that she would wear black to the State of the Union to protest Trump and his administration's policies. "I will be in all-black in protest, but I will be in attendance," Lawerence said. This entry was posted in Politics and tagged House Democrats, State of the Union. Bookmark the permalink.